Events → Merry Christmas and a Happy New Year 2012 ! 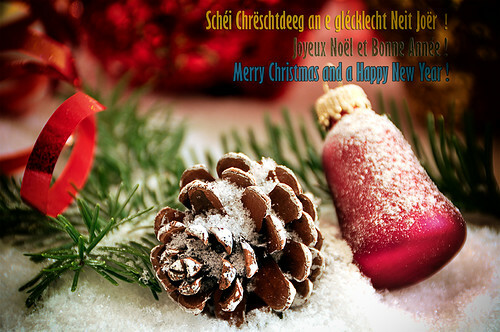 Wish you and your loved ones Merry Christmas and a Happy New Year ! Flickr Tags: "Merry Christmas" "Happy New Year! " You are kindly invited to a very interesting event, held at Prince Henri Centre, Walferdange, on December 19 at 20:00. Walfer FotoFrenn features George Schiltz with his “Cuba” on screen photo show. Do not hesitate to step in, there are a to of interesting photos to be seen. Flickr Tags: "Walfer FotoFrenn "Cuba by Georges Schiltz" Walferdange Luxembourg "Prince Henri Centre"